Rekkit (2011) : Série TV de 3 saisons et 104 épisodes diffusée sur Disney XD. Casting, acteurs, bandes annonces et actualités. Jay Shmufton est un jeune garçon ordinaire. Il rêve en secret de devenir un grand magicien et ne se laisse pas décourager par ses tentatives infructueuses. Alors qu'il s'entraîne dans son jardin avec une nouvelle baguette magique commandée sur Internet, il lit par hasard à voix haute la phrase qui y est inscrite "1, 2, 3, lapin zinzin, sort de là !" Un éclair surgit alors de la baguette et défonce le toit de sa maison. Totalement affolé, Jay rentre chez lui pour constater les dégâts et découvre avec surprise un lapin blanc géant de plus de 2 mètres, confortablement installé dans son lit ! Ce dernier, prénommé Rekkit, lui explique qu'il a fui son monde (Chakabrak) pour échapper à son terrible maître, le grand magicien Yoshini, qui le traitait en esclave. Il lui annonce aussi son intention de rester vivre chez lui. Les deux comparses deviennent alors des amis inséparables. La magie va entrer dans la vie de Jay. Il va vite découvrir que ce n'est pas de tout repos ! Casting de la série "Rekkit"
S01E01 L'arrivée 16/03/2011 After purchasing a magical hat, Jay finds himself the proud new owner of a giant rabbit named Rekkit. Rekkit is a stranger to Jay's world, and doesn't quite understand its rules. S01E02 Jay le médium 06/04/2011 Rekkit gets invited to a birthday party and Jay ends up getting them caught in a world halfway in between his and Rekkit's called Mirrorworld. S01E03 La mascotte 13/04/2011 After feeling that he can't grow up fast enough, Jay is shocked to wake up and discover a magical moustache growing on his face (courtesy of Rekkit). S01E04 Le pouvoir du piment 30/03/2011 Jay gets a crush on the new girl in school, only to discover that she is not a girl at all, she is a raccoon. S01E05 L'eau, ça mouille 24/08/2011 Jay convinces Sailor Sam to let him run his ice cream shack. Rekkit ruins all the ice cream, but to try and save the day Rekkit brings a magical cow to help. S01E06 Les ratons espions 08/06/2011 When Jay and Rekkit try to find out who has been stealing stuff around town, Jay discovers that it's been Rekkit! Rekkit has been sleep walking. S01E07 Les terreurs du salon 28/05/2012 After Mom and Lorne's latest jingle puts everyone to sleep, Jay and Rekkit try to help spice up the act. S01E08 L'invitation 30/03/2011 When Rekkit tries swimming in the lake, he becomes so scared of water that he gathers up the town's whole water supply in his magic bucket and pours it into a painting. S01E09 Jay-crevisse 08/04/2011 When Rekkit catches a cold, Jay's 'cold remedy' unleashes nose hamsters from Rekkit's nose who grow exponentially, have Scottish accents, and quickly kick Jay and Rekkit out of their house. S01E10 La moustache 24/04/2011 Jay and Rekkit accidentally break a piece of furniture. They go to a market to get a replacement but end up bringing back an entire living room suite of furniture that are actually criminals. S01E11 Portraits de stars 02/01/2012 Rekkit's old friend comes for a visit, but it quickly becomes clear that Fingerprint Boy is a very bad influence on Rekkit, and he has an ulterior motive for being there... he wants to get rid of Jay. S01E12 Trou de mémoire 04/05/2011 Jay's favorite volleyball player is playing at the local stadium and Jay desperately wants to go. Only one problem: the game extends until after dark, and Jay is not allowed out at night. S01E13 Un bruyant secret 22/06/2011 Jay finds a sweet kitty that he brings home with him. Everyone loves the kitty... except Rekkit who knows the kitty is evil! When no one believes him, he promptly runs away. S01E14 Un rhume de lapin 29/06/2011 When the twins save Rekkit from getting hurt in an accident, by magical law he is bound to them forever. Jay is crushed. He has lost his best friend. S01E15 Une fête déguisée 16/03/2011 Jay wants S.K. to ask him to the Sadie Hawkins dance but feels he isn't cool enough. Rekkit gives him a turnip that he guarantees will make Jay cool. It does, but it makes him rabbit cool. S01E16 Voyage au centre de Rekkit 27/08/2011 Being a smart aleck to Wiggsley, Jay is told that he is responsible for the school garden's success. Rekkit gets some magic dirt that has some strange effects. S01E17 Le jour des papillons 23/03/2011 Jay is miserable because he thinks he is lousy at volleyball. Feeling sorry for him, Rekkit zaps Jay with a confidence spell during a beach volleyball competition. S01E18 Un amour de yéti 04/07/2011 When Mr. Bixby the dog catcher mistakes Rekkit for a giant dog, he tries to capture him, only to capture Rekkit's tail instead. S01E19 Au service secret de Bill 21/12/2011 Jay and Rekkit get invited to Wally's birthday party, but when Rekkit discovers Wally has hired a 'Party Magician', he becomes terrified that this magician might try and take him back to Chakabrak. S01E20 Attention Hoquet ! 24/06/2011 When Lorne signs up Jay to compete in the highly embarrassing Little Mister Potato Guy contest, Jay turns to Rekkit for magical help. S01E21 Cours toujours ! 30/06/2011 Rekkit becomes the spokesbunny for Fluffy Bunny Toilet Paper. 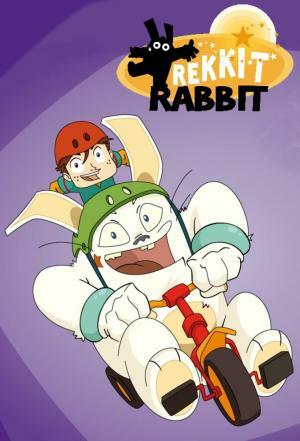 S01E22 Un lapin qui a la classe 20/06/2011 When science teacher Wiggsley discovers that Rekkit's tears are a natural source of energy, he kidnaps Rekkit with the hopes of making a fortune. S01E23 Le lapin et la tortue 05/12/2011 Trying to look presentable for a Music Teacher that is coming over to interview mum for a job, Rekkit decides to give himself a haircut. S01E24 La revanche du chaton 27/08/2011 Trying to find a quick way to clean his room, Jay asks Rekkit for some magical help. The result is that they are both shrunk down to the size of fleas. S01E25 Un Jay senteur florale 19/12/2011 While building his science project, Jay ends up creating a black hole in his basement (with a little magical help from Rekkit). S01E26 Les jumelles à la rescousse 11/05/2011 Muddlety Falls is awaiting the annual return of the butterflies who pollinate the town's lima bean fields. Unfortunately, Rekkit only knows butterflies from his world as tasty snacks. S01E27 La vache à glaces 11/05/2011 On an school outing to Reilly's Believe It or Else Museum, Rekkit accidentally brings a stuffed yeti alive. S01E28 Têtes de légumes 01/11/2011 Rekkit's friend Rainbow comes for a visit from Chakabrak. Everybody loves rainbow and his special fun time magic. S01E30 Quelle galère 28/10/2011 Because Rekkit thinks Mom's cooking is so great, he enters her in a magical cooking contest. S01E31 La grosse tête 27/04/2011 Jay has a secret: when he gets scared he still hugs a doll. He tells his secret to Rekkit, but he is desperate for Rekkit to keep his secret for fear that someone might find out and laugh at him. S01E32 L'ami glaçon 07/12/2011 When Rekkit finds out Jay is going over to visit his grandmother, and that Grandma is a stickler for good manner, Rekkit proceeds to go out and purchase a real 'gentleman's' suit. S01E33 Bienvenue dans mon rêve 20/04/2011 Mom and Lorne are preparing for an audition for a manager. Jay thinks their headshots are out of date and uses a camera from Chakabrak to take new ones. S01E34 Les boîtes à malheur 08/10/2011 With the big Quiz Bowl against the rival egghead school coming up, Jay uses some brain enhancer but he gets a big head... literally and figuratively. S01E35 Un dragon de compagnie 22/12/2011 Jay wishes there weren't any rules. Rekkit obliges with help from Arnold. Problem is that Arnold goes nuts getting rid of rules and gets rid of the rule of gravity. The town starts floating away. S01E36 La crème de jouvence 06/12/2011 Jay's parents give him a birthday party at an embarrassingly kid-like pirate restaurant. Rekkit grants Jay his wish to be somewhere else, making the ship-restaurant break loose and head to sea. S01E41 La magie arc-en-ciel 26/12/2011 Jay is having nightmares about a physical fitness test. In the dream he's doing the test in his underwear. So Rekkit goes with Jay into his dream to help him get his clothes back from his fear. S01E42 Abraca-oh-non! 09/12/2011 Mum tries to get Jay to bond with his stepdad Lorne by enrolling them in a stupid program where they dress up like superheroes. 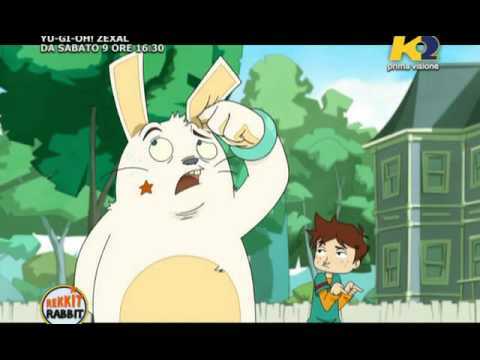 S01E43 L'union des super-zéros 14/12/2011 The Twins steal Jay's wand and get their own magic rabbit from Chakabrak, an insufferable rabbit named Booyah. S01E45 Fais pas ci, fais pas ça 02/07/2012 Jay and Rekkit try and bulk up. Unable to do it normally, Rekkit casts a spell so that when they eat meat, it's absorbed into muscle. S01E52 I'm Melting 28/12/2011 It's snowing in Muddlety Falls, and Jay decides to show Rekkit how to make a snowman. But when Rekkit discovers that the snowman will eventually melt, he uses a spell to keep it frozen. Envie de parler de Rekkit ? Les discussions sont là pour vous. Retrouvez toutes les informations sur Rekkit lancée en 2011 : synopsys, casting complet, acteurs, scénariste, réalisateur. Découvrez des séries similaires à regarder également. Faites vous une idée de la série grâce à la note des membres et aux critiques des internautes.